With this block finished at last, I have completed all the round robins that I've been stitching in for the last many months. This is Connie K's fan block. 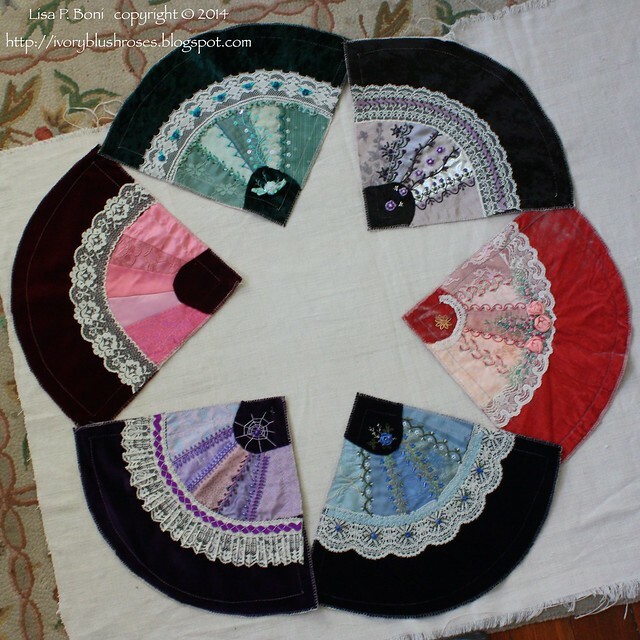 I am the last to stitch on her blocks and had my choice of a blue fan or a pink fan. I've been on rather a blue streak lately, so that's the one I chose! Here is the block before embellishment. 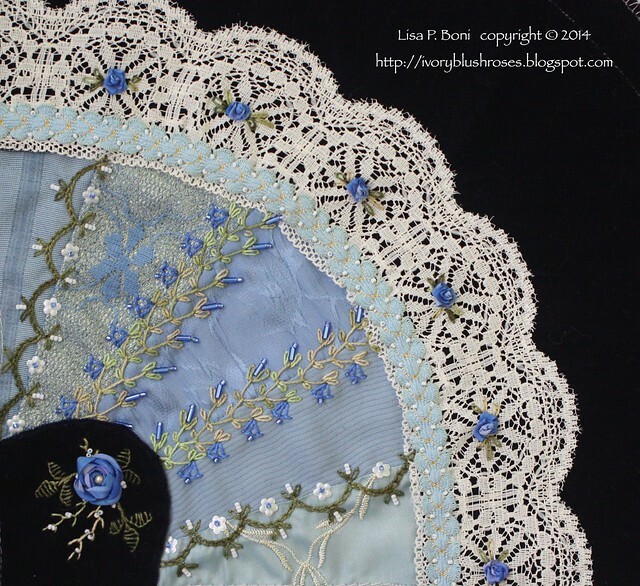 Connie asked us to not embellish the outer velvet portion and gave us the option to do something with the lace if we chose. 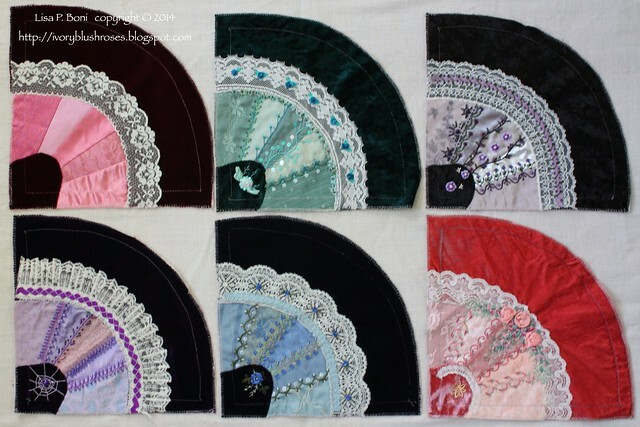 I focused on the fan seams to start with. 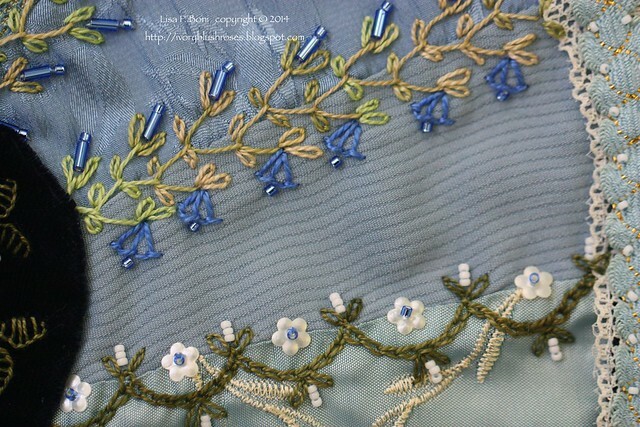 A feather stitched seam with a bluebell theme on the two center seams and some leafy scallops with white flowers for the outer. 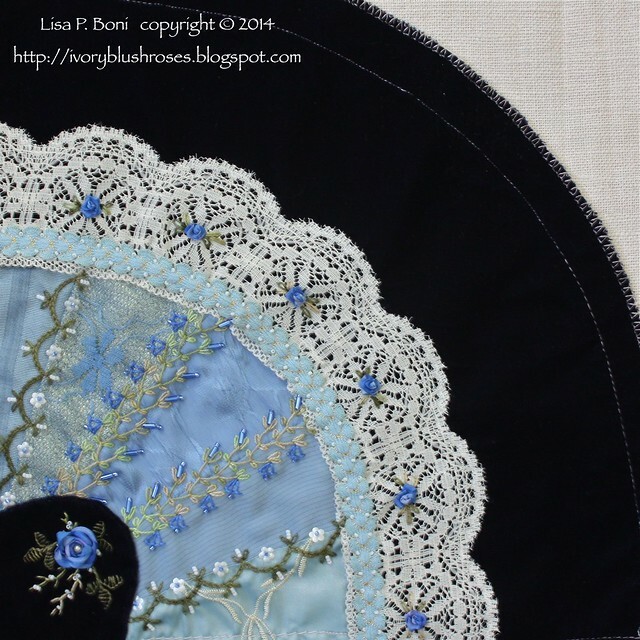 For the inside corner, I stitched a spider web rose. The greens are more green than this photo shows! 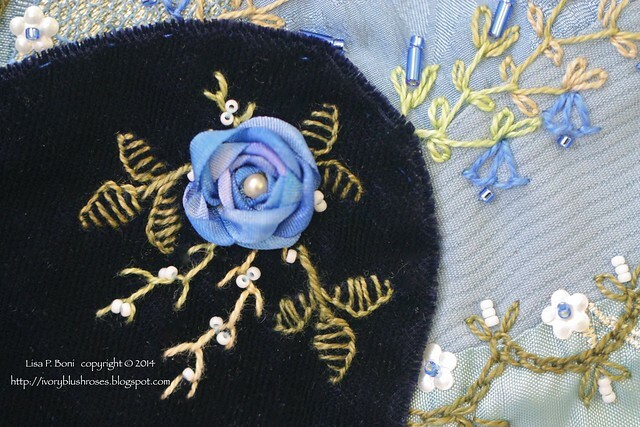 For the lace, I added some small fargo roses of ribbon that I had dyed when I was working on my daughter's wedding ring pincushion. It was too dark for that, but was just perfect for this block! I also added some vintage "shell" ric rac trim that I had. Overall, I'm really happy with how this block turned out and hope that Connie likes it too! Here are all the blocks after my work. The stitchers include Lisa A., Thearica, Judy D., Gerry K., and myself. Now the blocks head home to Connie K.! With the unusual shape of the blocks, I've been pondering how Connie will put them together. This is what I would do with them if they were mine! I've been having trouble getting my camera to focus properly lately, despite cleaning lenses and everything else that I can think of. There are many slightly out of focus photos as a result. Time to save up for a new camera I think! This camera has taken nearly 70,000 photos since I got it back in 2009! It's given nearly flawless performance in all that time. I'd love to upgrade to a "pro" level camera, but they are heavier and significantly pricier, so I have to do some hard thinking about what to get! Lisa, you bring such pleasure to my eyes. I am forever looking forward to what challenge you will take on next. Thank you for providing so much beauty to my world and for others to see and enjoy. So pretty, lovely work on Colina's block. 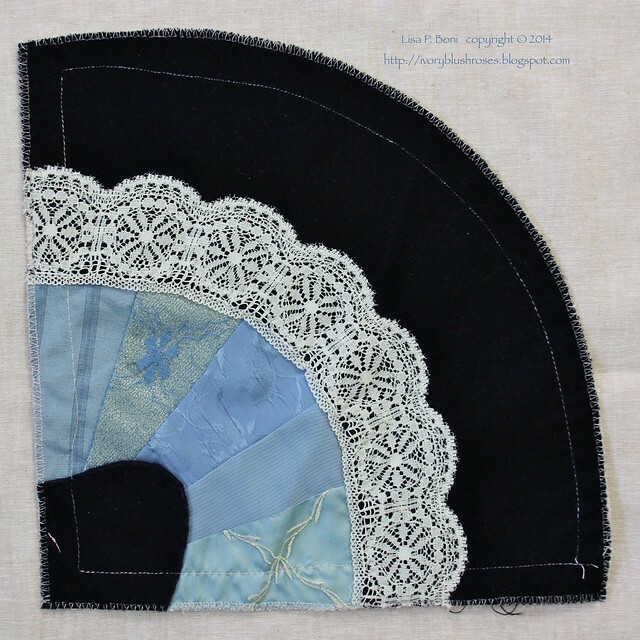 Once again you have added loveliness to a block with your wonderful stitching. I wonder how she is going to put these all together. Oh my, you are on a roll and I'm enjoying everything. Always trying to figure out how you do so many things so well!!! Those blocks are really beautiful. I'm sure Connie has something great in mind for them. 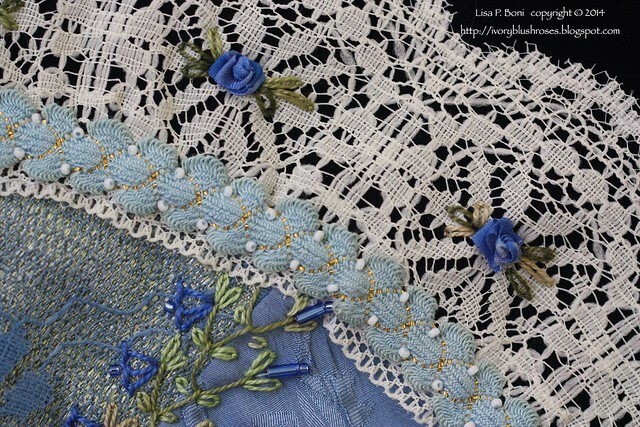 I like the way everyone has added a small touch to the lace too. Your work is gorgeous as always Lisa. The investment in my camera has changed my life. I think I would eat rice and beans to slowly pay off my balance. You can get the bottom of the line for a great camera...it's time. You are a beautiful photographer so go for it! !